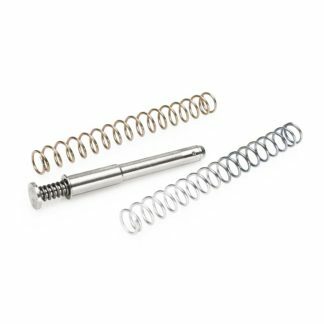 The DPM Beretta APX 9mm Standard Size Recoil Reduction Spring Rod by DPM Systems replaces the original factory guide rod/spring system and produces an advanced recoil reduction by absorbing the shock gradually and slowing the slide down before its impact with the frame of the pistol. Because the system is an interior modification of your pistol it will not change the external dimensions of the handgun, therefore there is no for a new holster, sights or any other accessory you own. 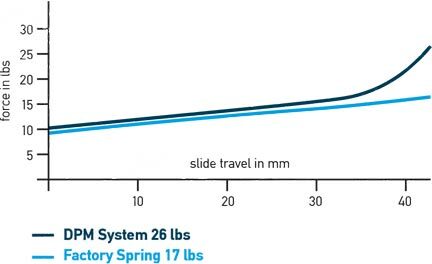 The DPM Beretta APX 9mm Standard Size recoil spring system works due to its multi spring rod design (three springs) by producing an advanced recoil reduction technique by gradually slowing the slide down before impacting the frame of the pistol using Spring No. 1 (see fig. below) and Spring No. 2. The third spring (Spring No. 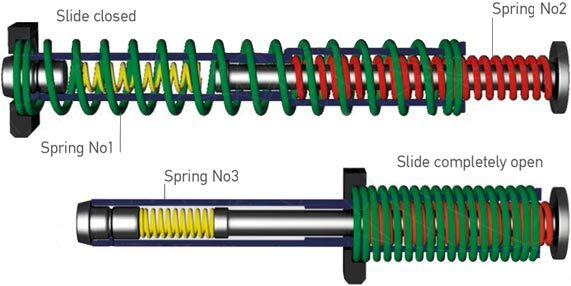 3) which is contained within the rod itself controls the movement of the slide so it never rams on the frame.